Borrego Springs Information Borrego Springs, the town where ABF’s office is located, is completely encompassed by Anza-Borrego Desert State Park’s 600,000+ acres. 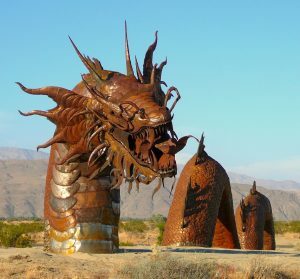 This small desert community in San Diego County has been aptly named California's Secret Desert™ because, despite its proximity to San Diego and Palm Springs, Borrego Springs remains largely an undiscovered gem. Come see what you’ve been missing! Whether it’s sunshine, solitude, golf or a day at the spa that you crave, Borrego Springs has it all — and more. 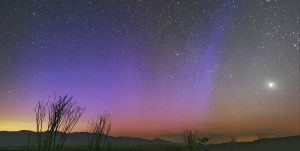 As one of only four International Dark Sky Communities in the United States, stargazing is a popular activity enjoyed by visitors and residents alike. Wherever you find yourself within Borrego Springs or the vast Park surrounding it, the perfect spot to enjoy the celestial show can be found right above you. 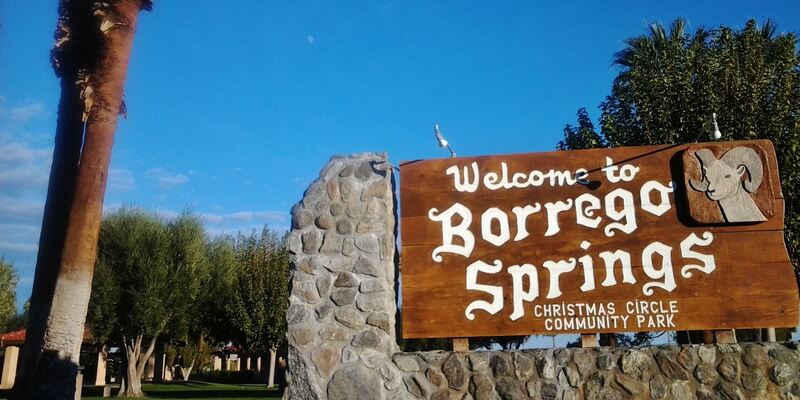 The town of Borrego Springs has many resources for park visitors, including groceries, lodging, restaurants and gas stations, along with other goods and services. For more information, please visit the Borrego Springs Chamber of Commerce. 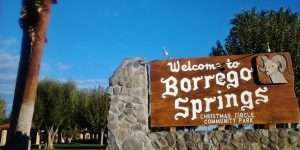 During the last weekend in October, the beginning of the “high season” in Borrego Springs is kicked off by the Borrego Days Festival. A parade, vendors and music bring visitors and locals together for a fun-filled, three-day celebration. Other festivals occur throughout the year, such as the Circle of Art craft fair in March. * Explore the popular, whimsical and extraordinary Galleta Meadows Sculptures * Meander through shops and galleries * Enjoy the Friday Farmer’s Market at Christmas Circle (November through May: 8 a.m.–12 p.m.) * Take in a show at the Borrego Springs Performing Arts Center * And, of course, spend time hiking, biking or riding in Anza-Borrego Desert State Park! While visiting Borrego Springs help support the businesses that support the Park. Check out our Partners here!